Ever since it finally dawned on me that my best chance of a red lipstick that was as transfer-proof as possible was a liquid lipstick, I’ve been on the hunt for my best option for my wedding day. I feel like I’ve tried nearly all of them by this point – if I’m honest it became a bit of an addiction to keep trying more, mooooore! I did have to draw the line – not before I’d done nearly the lot though. The only most glaring omissions in this post are probably Anastasia Beverly Hills and Jeffree Star (and any 2017 launches I’ve missed – I started writing this post in 2016!!) – but as they’re super expensive to get hold of over here I hope you’ll give me that. Otherwise, you’re going to see opinions on Nyx, Maybelline, Sephora, Kat Von D, Stila, Smashbox – with photos (all in the above picture), and further comments (because the colours I had weren’t quite in the true red category) on Limecrime, Colourpop, TheBalm and Bourjois. Spoiler alert – some of these are really brilliant and one of these is brilliant enough that it’s going to be my wedding day lipstick. The criteria was simple: a true, bright red that was as neutral as possible, matte or mostly matte and, vitally, kiss-proof and long-wearing, allowing easy touch-ups. Well, it sounds simple but actually it’s quite a big ask! Below I’m going to give you opinions rating the lipsticks out of 5 in various categories. There is one category that anyone who’s worn a liquid matte might be looking for – I haven’t rated any of these on how moisturising they are. That’s because, largely speaking… they’re not. The one thing I’ve learned from trying all of these is that you need to expect a certain out of drying from this kind of product. Some are worse than others, but pretty much all of these made my lips flake to some extent by the end of the day. I feel like how drying a formula is is deeply personal – some people will be worse with this than others, so I think if you like the look of one of these you’ll just need to see if it works for you. But otherwise, hopefully the categories are fairly relatable for everyone. Colour: 5/5 I just love the colour of this lipstick. It’s absolutely a true red on me and brightens my face. Texture: 3/5 And here’s where we start to go downhill with this one. It commits my least favourite liquid lipstick crime and doesn’t dry down completely, staying a bit tacky and slightly glossy (no!) forever. Transfer: 2/5 It’s not as bad as the next lipstick I’ll talk about as the colour itself won’t leave your lips, but this stuff is dreadful for transferring. It’s because it doesn’t fully dry, meaning it doesn’t set in the way some of the others I’ll talk about do. Wear: 2/5 Not going to be a surprise, but something that doesn’t set properly doesn’t stay on your face properly either. Worse than that, over the course of the day it does this weird thing where it creates mini ‘blobs’ of product on your lips, which in my case have fallen onto and smooshed into my clothes. Not every time by any means, but who wants to run that risk? There is no way on earth I could wear this on my wedding day with a white dress!! It’s got a 2, though, because the colour does stay on pretty well regardless. Touch-ups: 3/5 You can reapply over an older layer, but I think it might be the course of the blobs, partly. Price: 5/5 It’s £6.50 over here and you can’t really say fairer than that for what you’re getting. A strong budget option. Total: 20/30 Not bad for the first one of the batch and I do still sometimes put this on if I’m not going to be wearing lipstick all day long – for evenings where I’m not going to be eating I’d be quite happy to reach for it. Texture: 1/5 No no NO Maybelline! Sticky as heck, this is basically a gloss in texture and not at all what you expect from a matte product. For a start, it’s not remotely matte. Not even a little bit. I mean, just look how shiny it is in the above photo! Wear: 2/5 Er, I have to admit the minute I put this one on I took it off again because I hated how it felt and looked, but judging on how much product came off on the blot test, this one isn’t going to be sticking around. Touch-ups: 3/5 Again, this is kind of guesswork but I’m basing this judgement on the fact the formula is more comparable to a wet gloss, so I’d expect it’d be fine to touch it up without the problems the Nyx has. Colour: 4/5 This is going to be a lot of people’s idea of a classic, true neutral red and the pigment packs a punch. On me, it’s ever-so-slightly too cool, which is why I’ve knocked a point off. But I have to admit it photographs probably the best of all of these! Texture: 5/5 I actually love the finish of this one and how it feels on the lips – it’s matte and it’s really comfortable to wear. It’s probably one of my favourites, if not my favourite here for the formula’s consistency. Transfer: 4/5 It sets and holds, but will (like a lot of these) start transferring when you’ve had something to eat and a tiny bit here and there beforehand. Wear: 3/5 It’s pretty good, I’ll give it that. But when you’ve eaten something it’s going to be on its way out and as is also the case with some of these, it will disappear entirely from the centre of your lips. It might bleed in the corners of your mouth too. Touch-ups: 5/5 Re-application is pretty painless with this one. Price: 4/5 c.£11 – one of the cheapest here and really good value for what you get. BUT a challenge to get hold of in the UK. Total: 25/30 I know a lot of people who love this lipstick and I think it’s for good reason (and no, it’s not a miracle worker – like most of these it will dry your lips out!). It would be a favourite of mine if the wear was slightly better and, more importantly, the colour a bit more my thing. Colour: 4/5 This is very similar to the Sephora to be honest (and to the KVD shade Outlaw – it’s kinda impossible to tell the difference with those two), a classic red with a cool tone to it. So again, it’s not ideal for me but for others it would probably be worth taking a look. Texture: 5/5 My favourite for how it feels on – this is quite a thin formula and it’s light and comfortable to wear. It never gets a sticky or heavy feeling (but it is one of the worst here for me in terms of drying lips out, but as I say they all do). It’s quite possible to forget you even have it on. Transfer: 4/5 Perfectly kiss-proof after fresh application, but then will leave an imprint of your lip line once it starts to wear. Very, very typical of these products. Wear: 3/5 This isn’t top of the class for wear – it’s immaculate until you eat and then it’s on its way out. It will eventually disappear totally at the corners of your mouth but worse than that, it bleeds into the skin a bit. It can look quite messy by the end of the day on me and it sort of goes darker – the colour I take off never feels like the same as I put on, weirdly. Touch-ups: 4/5 Like many here, if you can get the oil and moisture off your lips you can top it up pretty successfully. Price: 3/5 £16 is on the pricey side for a lipstick, but it is very good quality so if you find a colour you like it might be worth the investment. Total: 23/30 Definitely one of the better liquid lipsticks out there and a cult favourite for a reason. Colour: 3/5 I really want to love the colour of this lipstick and I know it’s a favourite with many ladies, but it’s just a bit too dark and cool-toned for me. It doesn’t photograph quite as deep as it really appears – I would say this is a Russian Red type colour, so if you like that lipstick you’ll get on with this one better than I did (I hate that lipstick!). Texture: 4/5 It’s not quite as pleasant a formula as the Kat Von D, but it’s very comfortable to wear and dries down nicely without feeling heavy. It’s simple enough to forget you’re wearing it. Transfer: 4/5 This is going to keep coming up, but as per most of the lipsticks that dry down well to start with, this one holds fast with minimal/no transfer until you put food in your face. Especially greasy food. And then you’re going to see that ‘lip halo’ of your lip line I mentioned again. Wear: 3/5 It’s probably on a par with the Kat Von D but for different reasons. With this one, I find you get the same corner-of-the-mouth bleed issues after eating sometimes, but another thing it does is disappear in patches from the centre of your lips. The next lipstick I’ll talk about has a more gradual fade that I much prefer. Touch-ups: 4/5 I can’t really fault it again once you make sure your lips are totally devoid of any oils. Price: 3/5 £16 again, so it’s not cheap, but this is a very good quality liquid lipstick and a favourite of a lot of people’s. Total: 21/30 I like this one a lot and if the colour works for you you’ll probably put up with its slight flaws! Colour: 5/5 Jackpot for me! This doesn’t have that slightly dark, slightly cool edge a lot of red liquid mattes do – it’s a bright, true red on me and my favourite colour of the bunch. Its slightly warm (they call it ‘yellow red’) undertone might pull differently on you if you’re more cool toned than me, for which I suggest checking out their shade Bawse instead in this range. Texture: 3/5 This doesn’t bother me when it’s freshly applied – I forget I have it on. The only reason it loses points is that by the end of the day it starts to feel a bit… the only way I can describe it as is ‘thick’ on the lips. You just notice it’s on and I look forward to getting it off. It’s not enough to make me not wear it and to be honest most makeup by the end of the day I can’t wait to get off my face! But it is something that I don’t feel with the KVD or Stila, for example. Transfer: 4/5 Like most of the good liquid mattes, it’s solid when freshly applied and totally kiss-proof. But when it’s touched food it will after that point leave a bit of a trace behind. I find that blotting the loosened colour off and topping up with a fresh layer stops that happening. Wear: 5/5 It’s pretty much as good as you’re going to get with a liquid lipstick and the best thing about how it wears, is unlike the KVD which is great in most other respects, it doesn’t wear off in big patches in the centre of your lips like that one or bleed in the corners. It’s a more gradual fade and honestly, after eating, most people I’ve polled barely notice it’s disappeared a little. This stuff is king of the liquid lipstick wear. Touch-ups: 4/5 It’s easy to layer more product over without any repercussions – and because wear is so good you don’t need to re-apply much. It loses a point because once you start layering it gets that kind of thick feeling I described above. Price: 2/5 I can’t pretend that £19 for a lipstick isn’t ridiculously expensive. I will pay it again and again for this one because I do love it. Total: 23/30 It’s not a perfect lipstick, but there’s probably no such thing as perfect. It’s very, very good though. And so, those are the lipsticks I’ve photographed. Here’s the ones I haven’t! Colour: 1/5 I absolutely hate this shade. It is the single most unflattering thing I’ve ever worn on my face. Rumour has it, the original Red Velvet formula was actually nice, but then they changed something and now it’s just so dark and so cool toned, it makes me look like I have jaundice when I wear it. And that’s why you aren’t seeing a photo of this one! It is in no way a true red. Texture: 3/5 I mean, I don’t have a massive beef with how this feels on but it’s a much thinner consistency than some of the others here and I find it runnier and harder to apply. It also has a weird smell. Most of these lipsticks have zero smell so I didn’t give it a category, but not this one. Transfer: 3/5 Like a lot of these, it’s fine when it’s applied and freshly dried, but after eating you’re going to see it on the move. The real problem with this one, though, is you can’t easily touch it up (see below). Wear: 3/5 I haven’t worn this one for a while because it looked just so awful, but I don’t remember it being spectacular and I’m pretty sure it did that thing of totally disappearing in the centre of your mouth post eating. Price: 3/5 ASOS have just started selling this here for £15, so this one is mid-high price. For the money, it’s absolutely not worth it. Colour: 2/5 Well, this isn’t a true red by any measure, but that’s probably the fault of my own internet research and not the lipstick’s. I thought it would be a warm red, but actually it’s more of a bright coral. It’s an unusual colour though and one I quite like. Texture: 2/5 This is a very dry, chalky formula. It isn’t as liquidy as the others here and some people will prefer that as it’s a bit easier to apply accurately, but I just personally don’t like the way this one feels. It’s not 1/5 though, because it’s not uncomfortable to wear as such. Transfer: 4/5 It’s basically as good as most of the high-end lipsticks here in that it’s not perfect after food, but it doesn’t really transfer more than the usual faint outline onto cups, utensils etc. Wear: 4/5 Again, it’s in the leagues of the big boys and it does a really good job for such a low price lipstick. Touch-ups: 3/5 I think because this is such a bright colour, it highlights imperfections more. I tend find that I’m applying another layer over patches of skin its clung too from the first application. Price: 5/5 Although not as cheap to buy in the UK, in the US these are a few dollars and that really is good value for what you get. If you want to start experimenting with liquid lipstick this isn’t a bad place to start. Total: 20/30 As I say, it’s a good place to start and great value for money. Colour: 2/5 This one just isn’t a true red on me, I’d describe it more as a red fuchsia. It’s so blue it’s pink, basically (and it’s quite dark on me). It’s a pretty colour, just not what I wanted. I wouldn’t gripe, but the picture on TheBalm’s site makes you think it will be a brighter version of Loyal, which I now think would be a closer true red. Texture: 2/5 I love the feel of this as it goes on, but then it does my least favourite thing and stays a bit tacky after others here dry down to a smooth finish. It does have a wonderful mint-chocolate type smell though, which is nothing to do with texture but I had to mention it! Transfer: 2/5 It doesn’t transfer as badly as the Maybelline, but it’s not ever completely kiss-proof as it never really dries fully like most of the others here. Touch-ups: 4/5 No real problem putting a fresh layer on over an older one, but it’ll still be a little bit sticky! Price: 3/5 This one will set you back £13.50, which is a fair price, I think. Total: 17/30 I don’t hate this lipstick and if there was another colour I loved, I’d overlook the slight tackiness for the price and gorgeous mint smell. Colour: 2/5 It’s not a true red, it’s an orange red, but worse than that, the colour applies very thinly, like a balm – to get a solid red and not more of a stain type effect, you have to keep layering up the product. Very annoying. Texture: 2/5 This takes forever to dry to its matte, smudge-proof finish. Forever. But once it does, it’s quite comfortable to wear. However, I know I wasn’t going to talk about these products being drying, but this one does something very bad to my lips the next day. They will peel like nothing I’ve ever seen. Transfer: 5/5 It holds pretty well for me… I think because it is more of a stain than a liquid lipstick. Price: £8.99 3/5 It’s not a bad price, but this product isn’t really good enough to justify it. Total: 16/30 If you are after a matte-finish stain that you don’t mind taking a while to dry, this lipstick range is worth a look… Not what I wanted though! So, there you go, 10 reviews of 10 entirely different lipsticks each claiming to be a liquid matte! This post took forever to write, so I really hope someone gets to the end of it… or finds it even remotely helpful. And if you got this far, can you guess which of these lipsticks is the one I’ve picked for the big day? You don’t have long to find out which it is! Stilla and KVD are definitely my 'go to' brands – in fact that's pretty much all I wear when it comes to blog photos because they are so pigmented and photograph so well. I've got my eye on Underage Red (what a name!) right now actually… Neither of them are 100% perfect but I'm pretty happy with them. The middle of the lip fade is a major bummer though. If I'm ever feeling wild I might just try Smashbox because it really does look like a good colour in these photos – the price is a bit intimidating but I'm glad it does the job! That is so horrible for you re Limecrime…! Ha, I partly jest, as I'm sure not everyone hates it as much as I do, but I'm quite confident when I say that there's much better liquid lipsticks on the market now. I do love the formulas of the Stila and KVD as I'm sure has come through – they're good quality options. Seriously though, Outlaw is identical to Underage Red so if you hate the name just buy Outlaw!! I have a theory they're the same because she got some stick about the name and it'll be phased out, leaving Outlaw still standing. So few lipsticks don't do the middle-of-the-mouth fade… Smashbox is the only one I trust to fade more evenly! I was surprised you hated Lime Crime so passionately, for me it's the longest wearing lipstick I own and I've collected several of the shades which I all love. With NYX, honestly I HATE the Liquid Suede formula, if you ever want to try any of their lipsticks try the Soft Matte Lip Cream or the Lip Lingerie, they dry down properly and don't budge. I'd like to try Smashbox some day based on what you've said. There's always a large element of personal preference with makeup, but it's the reapplication of the Limecrime that drives me the most crazy! I've tried the Soft Matte and I found it ok but not as good as a lot of the others here. The Lip Lingerie does intrigue me though! This was insanely informative! As a makeup newb (I only wear lipstick), I don't know a thing. I have been wearing glossy lipsticks (a line called Moisture Renew, to be precise as it is pretty good at NOT drying out my lips too much) and haven't tried too many matte lipsticks but as my current red is running low, I may try something new! This was a great way to start!!!! Glad to help 🙂 I find glossy reds hard to wear because it feels like they transfer and slide off more easily, but matte red liquids can really stay put if you find a good one! I am in awe of the time and effort this post must have taken. Your attention to detail is amazing, I don't normally wear lipstick but you make me want to give it a try. And I really love your hair in these pictures! I won't lie, it took a while! But I felt like I had a lot to say about the subject in the end… and thank you! This is so in depth, I love it! I think I have an idea of which one you'll be wearing on the big day – can't wait to see if I'm right. My personal favorite red is MAC Retro Matte in Feels So Grand. 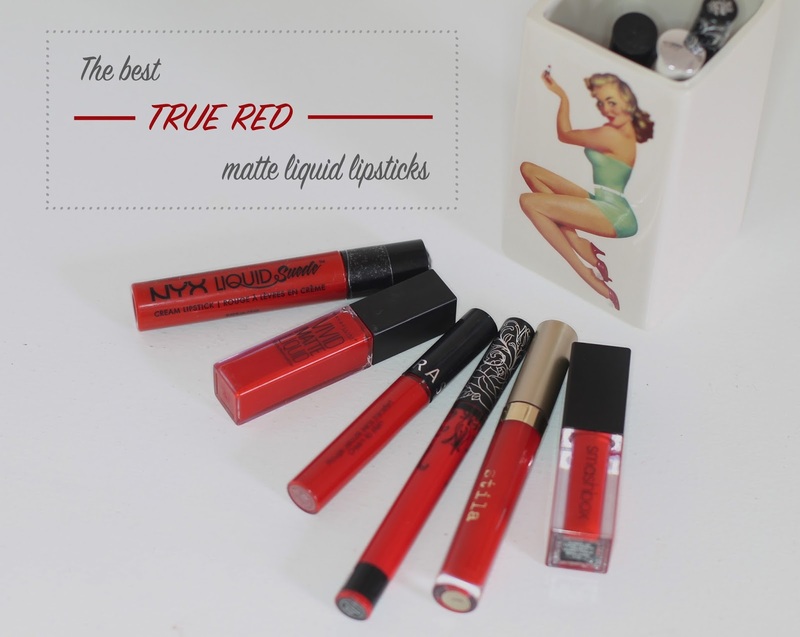 There are so many great liquid lipsticks out there now, though, it's hard to pick a favorite! Ooh, can't wait to see if you've guessed right either! And I really want to try that one – I nearly did buy it for this post, but I had to draw the line somewhere as at one point I was spending something stupid like £50 a month on red liquid lipsticks… only for half of them to not even turn out to be that red. There's a few not here from the same brands that I didn't even mention… yikes. I will try that one one day though!